just how hard is it to find a plane at the bottom of the ocean? Imagine standing on a mountain top and trying to spot a suitcase on the ground below. Then imagine doing it in complete darkness. That’s basically what crews searching for Malaysia Airlines Flight 370 have been trying to do for a month. 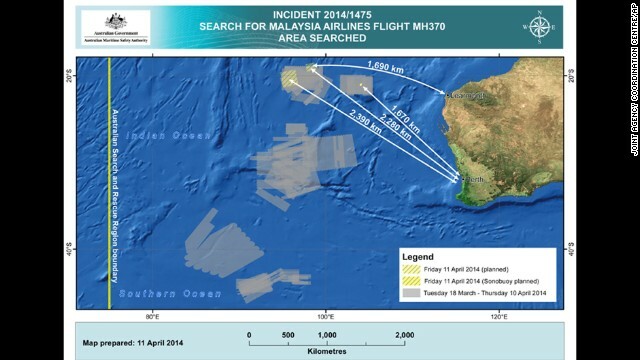 Thursday is Day 34 in the search for the plane that disappeared March 8, taking with it 239 passengers and crew members. Officials believe the Boeing 777, while en route from Kuala Lumpur, Malaysia, to Beijing, crashed in the southern Indian Ocean. Pinning their hopes on signals they think came from the plane’s black boxes, they narrowed the focus of their search Thursday to a 22,400-square-mile (58,000-square-kilometer) area — about 45 times the size of Los Angeles. But the real challenge is the depth of the water they’re dealing with. The underwater pulses that were detected Saturday, and again Tuesday, came from the ocean floor 15,000 feet below the surface. That’s 2.8 miles (4.5 kilometers). On Thursday, said officials said another signal may have been detected from sonar buoys. How deep is 2.8 miles? It’s deeper than an inverted Statue of Liberty (305 feet), deeper than an inverted Eiffel Tower (1,063 feet), deeper even than an inverted Burj Khalifa, the tallest building in the world (2,717 feet). In fact, if you stacked the Burj end-to-end five times, it would reach only 14,000 feet — still not deep enough to reach the spot searchers believe the pings are coming from. At these depths, marine life is unlike anything most people have ever seen. The pressure at nearly 15,000 feet is crushing — so much so that very few manned submarines can withstand it. Only a handful of people have traveled to such staggering depths. One of them is movie director James Cameron, who using a state-of-the-art vessel, dropped 35,000 feet, or about 7 miles, to the deepest place on Earth — the Challenger Deep in the western Pacific Ocean. Finding the plane is daunting. Bringing it back from the deep will be even more difficult. “At these depths … there’s no recovery like it,” said Mary Schiavo, a former inspector general for the U.S. Department of Transportation. 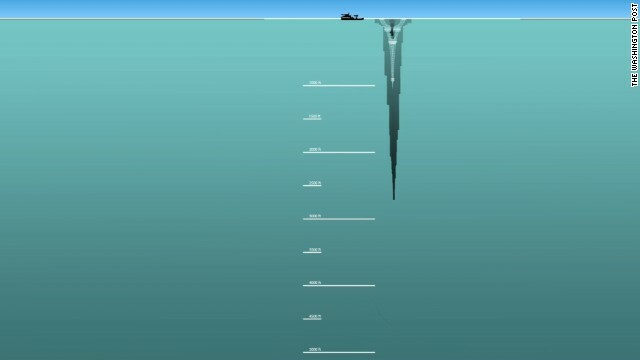 When the Titanic struck an iceberg and sank in the Atlantic, it took some 70 years to discover the wreckage. It was resting 12,500 feet below the ocean’s surface, and it still lies there today. When Air France Flight 447, with 228 people on board, plunged into the South Atlantic Ocean during a storm in 2009, the precise location of the wreckage remained a mystery for almost two years. Then the plane and its dead were found in a mountain range 13,100-feet deep on the ocean floor. Miniature submersible vehicles retrieved the Flight 447’s voice and flight data recorders. Eventually 154 bodies were recovered. Seventy-four still rest in the watery grave. But Amirtham Arupilai isn’t accepting that fate for her son, Puspanathan, who was on board MH370. “My inside and my heart is telling me still they are alive — all the passengers are alive,” Arupilai said. Her son, an IT specialist, was headed to Beijing to begin a new job. To his parents, he was everything. She calls Puspanathan’s cell phone and hears his voice mail greeting. She takes it as a sign he must be safe.